It was just two years ago that the local biology community stood in stunned disbelief as news spread that Mad River Biologists and its founder, Ron LeValley, were under investigation for embezzling almost $1 million from the Yurok Tribe. This wasn't some backwoods outfit or a fringe biologist with a shady reputation. This was Ron LeValley, a man who, over decades on the North Coast, had developed environmental credentials that could stand with the best of them. Mad River Biologists, his Eureka-based consulting firm, had risen to the top of the profession over 30 years. When the state began the controversial process of implementing the Marine Life Protection Act, LeValley was selected as co-chair of one of the scientific advisory teams. LeValley also started a nonprofit, MRB Research, that was regularly awarded grants from the U.S. Fish and Wildlife Service to conduct research on Western Snowy Plover populations, and he served on the boards of several others. From the outside, LeValley's private life seemed in lockstep with his public persona as one of the North Coast's standout biologists. 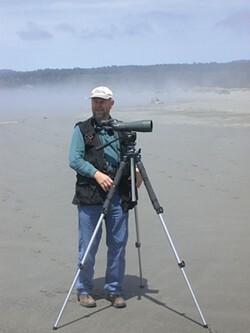 He began bird watching in Humboldt County during a 12-week stopover when he served in the U.S. Coast Guard in 1970. He never stopped, ultimately joining the county's exclusive 400 Club, a designation reserved for those enthusiasts who have recorded 400 or more species in the field. LeValley seemed to relish in sharing with others, sending out a daily birding picture dubbed "Outside My Window" from his wildlife photography website, which boasted more than 90,000 images, and creating an audio cassette of bird calls for the amateur enthusiast. He even volunteered some weekends to lead trips for the Mendocino Coast Audubon Society. When fellow biologists spoke of LeValley, a graduate of Humboldt State University's master's program in biology, they used terms like "mentor," "beyond reproach" and "exemplary." So, when news of the investigation and LeValley's subsequent arrest hit headlines, there was an air of disbelief. "There is no way that this is even possible," C.J. Ralph, a research scientist with the U.S. Forest Service, told the Times-Standard in the days following LeValley's arrest, echoing the sentiments of many. "With all the work they have done over many years — and Mad River Biologists has set a very high standard for intellectual and financial integrity — I have no doubt that when this finishes up, they will be found not to have done anything wrong." Well, the whole thing is now finished up, and LeValley has admitted to doing plenty wrong, including setting in motion a scheme that saw Mad River Biologists submit dozens of fake invoices billing the Yurok Tribe for survey work it had never done. When checks would come back from the tribe, Mad River Biologists would take 20 percent off the top before routing the rest of the money back to then Yurok Tribe Forestry Director Roland Raymond. The survey work LeValley claimed his company performed was primarily supposed to be looking for habitats for the northern spotted owl in order to determine what tribal properties could be logged without harming the federally endangered birds' nesting habitats. It remains unclear whether Raymond and LeValley's conspiracy affected timber harvest plans or led to the destruction of potential owl habitats. In a letter submitted to a federal court after LeValley followed Raymond's lead and pleaded guilty to a single federal count of conspiring to embezzle from an Indian tribal organization, LeValley addresses his conduct publicly for the first time since his arrest. "I accept full responsibility for the offense that I committed," LeValley writes. "I agreed to allow the false invoices from Mad River Biologists to be submitted to the Yurok Tribe for work that we did not do. I then gave most of the money paid to MRB by the tribe back to Roland Raymond, although I kept some of the money and used it for MRB's operations." In a memorandum to the court from the federal government arguing that LeValley should serve a year in federal prison, we learned that some of that money kept for "MRB's operations" went to pay LeValley more than $55,000 in 2009 and 2010, and to finance the re-roofing of an employee's home. LeValley writes that he was lured into the conspiracy by Raymond, who LeValley says told him the pilfered funds would be used to pay forestry and fire crews to the ultimate benefit of the tribe and its members. (According to court documents, Raymond used all the funds he received back from LeValley's company to support his gambling and drug addictions.) "I was shocked when I found out the truth about where the money went and that the fire crews that were supposedly getting paid by this scheme did not exist," LeValley wrote. But the feds make plain in their memorandum that LeValley can't play the innocent victim card, noting that it cannot be said he was "entirely naïve, or duped, regarding the significance of the arrangement." The U.S. Attorney's Office notes that investigators found numerous e-mails between LeValley and Raymond in which LeValley expresses concern about their arrangement coming to light. The memorandum also details how LeValley ignored a kind of intervention staged by his staff. "The evidence shows that in 2009, certain MRB employees were concerned about illegality when they realized the tribal money was moving through MRB with no corresponding work being done," the memorandum states. "They felt strongly enough about it that they convened an in-person meeting with LeValley, who had moved away to Mendocino. At that meeting, the employees questioned the legitimacy of the false invoicing and encouraged LeValley to end the practice. ... LeValley chose otherwise and continued the scheme through 2010 over his employees' objections." In the next year in which LeValley continued the relationship with Raymond they embezzled another $500,000, according to the memorandum. On May 20, a judge put the case to rest, sentencing LeValley to serve 10 months in a still-to-be-determined minimum security federal prison — less than a third of Raymond's three-year sentence —and ordering him to join Raymond in re-paying more than $850,000 to the Yurok Tribe. Tribal Chairman Thomas O'Rourke voiced outrage at the sentence, calling it a "slap on the wrist" and dubbing LeValley "a crook." In some circles, this view of LeValley the "crook" has served to either create or reinforce doubts about the science underlying his work, whether it was charting out MLPA protection zones, staking out nesting grounds for the snowy plovers or working to protect Marbled Murrelets. After all, the thinking goes, if he forged invoices, who knows what other work Mad River Biologists simply may have not performed? In his letter to the court, LeValley notes that his "reputation has been ruined." But — while one can imagine a crime like this rendering LeValley an outcast from the biology community — that doesn't seem to be the case. When the Pacific Seabird Group — a nonprofit group dedicated to monitoring and conserving sea bird populations — held its annual meeting in Juneau, Alaska in February, LeValley not only attended (after receiving a grant from the court allowing him to leave the state while his sentencing was pending) but presented a paper on pelagic cormorants. Of the 80 or so letters that flooded the court on LeValley's behalf, more than a handful came from colleagues who raved about his scientific knowledge, generosity and moral fiber. In the last two years, an image has emerged of LeValley as a birder and environmentalist who knowingly and systematically circumvented federal and tribal governments by pretending to do surveys designed to protect a federally endangered species, at least in part, to line his own pockets. Then there's the image of LeValley the environmental scientist, lover and protector, engrained over decades of work. As LeValley prepares to voluntarily surrender himself to federal prison on July 1, the greater communities of Humboldt and Mendocino counties continue struggling to reconcile these contrasting images.